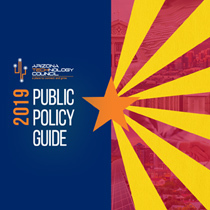 Since 2015, the Arizona Technology Council has published an annual Public Policy Guide, a detailed document listing the Council’s legislative priorities for the upcoming session. The guide is made available on the Council website and is mailed to every member company and Arizona lawmakers. Improve the business climate for technology-based companies. Provide sources of risk capital that encourage entrepreneurship. Create an environment that supports science- and technology-related job retention and creation. Attract, train, and retain the talent required to compete in a global innovation economy.